Microsoft frontman Bill Gates spoke to students at Stanford earlier this month, praising young people for their innovation, and raising awareness for philanthropic work. The talk began with a spoof video, during which Gates detailed his post-retirement plans. After retiring from his job at Microsoft later this year, Gates has a goal to break into the music industry. But, in the video, Jay-Z doesn’t have the heart to tell him that his chances are slim. And Bono tells him there is no chance of replacing The Edge as U2's guitarist. During the spoof, Gates also considers a career in film, and goes to director Steven Spielberg for help. Spielberg does what he can, though George Clooney isn’t so hot on the idea. The video goes on to show Gates asking Hillary Clinton and Barack Obama if he can be their running mate, and finally calling Al Gore. “No, it’s not an inconvenient time… Yeah, I get it. That was a good one,” says Gore. After the video, Gates returned his Stanford talk to the topics at hand. “One of the best investments any company makes is in its research group and in the relationship its research group has with universities,” Gates said. “Students have really been at the heart of a lot of breakthroughs.” Microsoft announced that same day that it is making its software development tools available to high school and college students at no cost. Gates then discussed his plans to work full-time with the Bill and Melinda Gates Foundation, stating that his focal point is curing diseases, particularly life-threatening diseases in the Third World. He pointed out that there is a ratio of about 50 to 1 in the spending on finding a cure for baldness vs. finding a cure for malaria. The foundation was famously pledged $37 billion by Warren Buffett in 2006, having already made grants totalling $10.5bn in the previous 12 years. 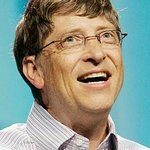 Commenting on Buffett’s donation to the fund, Bill Gates said, “It is a big challenge to make sure this money gets used in the right way, but it is one we are thrilled about.” And soon, Gates will be dedicating his entire working day to doing just that.